How are you? I’m not well as weather here in Gurgaon is taking a toll on my health now. So I’m not gonna blabber much today. I have subscribed to Fabbag (earlier known as velvette.com). They have monthly, quarterly, half yearly and annual subscriptions available. Every month they send 4 luxury brand products and out of which 1(sometimes 2) will be full sized products and rest will be sample size. Overall I like the bag since it is customized as per your answers to a quiz which you fill when you register on their website for the first time. This is again a pic-heavy post as I don’t feel like typing much. Theme of May bag is summer essential. And bag is pretty yellow and black pouch. I really like their bag as they serve purpose of mini makeup kit 🙂 Look on to see what all I got in my May Fabbag. Fabbag always sends a personalized card giving detail about the theme and the list of products in the bag. 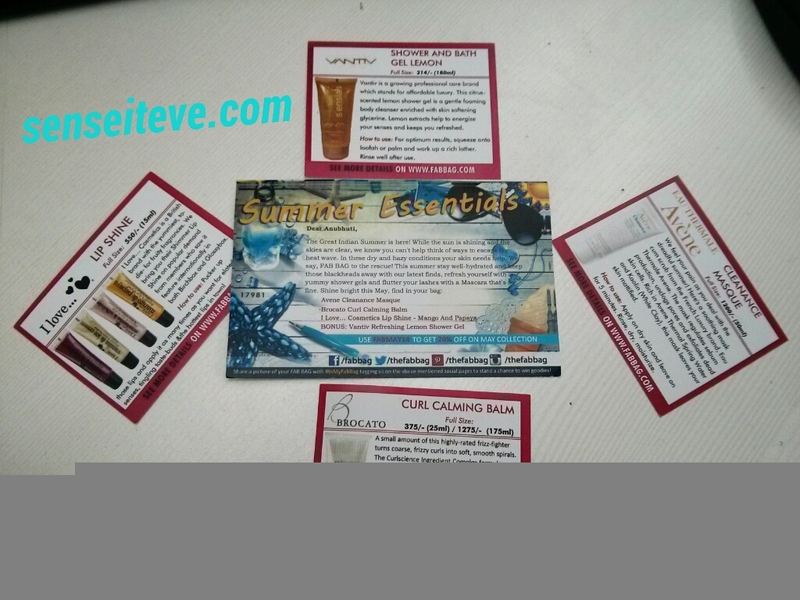 Also they send individual cards per product giving a brief description about the product, How to use instructions and price of full size products. 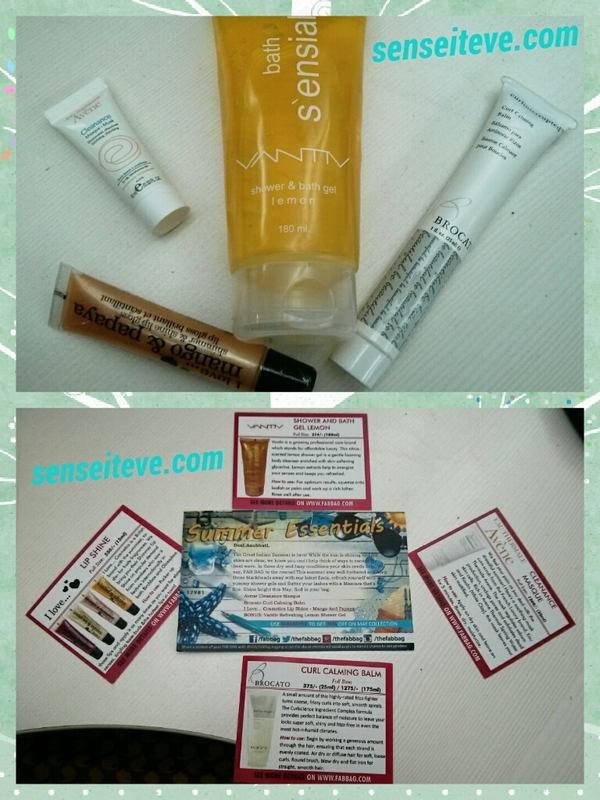 I have got One body wash from Vantiv , curl calming balm from Brocato, lip gloss from I Love and a clearance masque from Avene. Out of which body wash and lip gloss are full size products and other 2 are samples. Read on to see what I liked and disliked about my fabbag. Honestly I didn’t like the product at all as it has very overpowering smell which gave me headache as soon as I opened the tube and smell it. And I have never heard of this brand before so I’m disappointed with fabbag team for including this in my bag. Other people have got Organic Surge bodywash in their bag. (I’m not paying every month for some new unknown average brand product every month). Since fabbag has oncreased their subscription price, I was expecting good products. So this one is total turn-off for me. (After seeing this I wish I should not have renewed my subscription this month). Though i may not buy it seeing its full size product price. But I’m happy that i got this full size product (that is why i love fabbag because you get full size product which alone costs more than the price you pay for whole bag). 10ml sample size product, it would last me good 3-4 usage. I have not used it yet but once I do I’ll do mini review on it. Overall I am very disappointed with my fabbag for may. Hoping this month something good will come. As I have renewed my subscription 3rd time so you can understand that they are not bad every month and most of the time the bag do feel like it’s customized for you.